Are you ready to graduate from the ice park and explore the backcountry ice climbing in Cody? Travel with Chicks this winter to experience one of North America’s premier ice climbing destinations. The South Fork Valley of the Shoshone River is home to the largest concentration of waterfall ice in the lower 48 states. 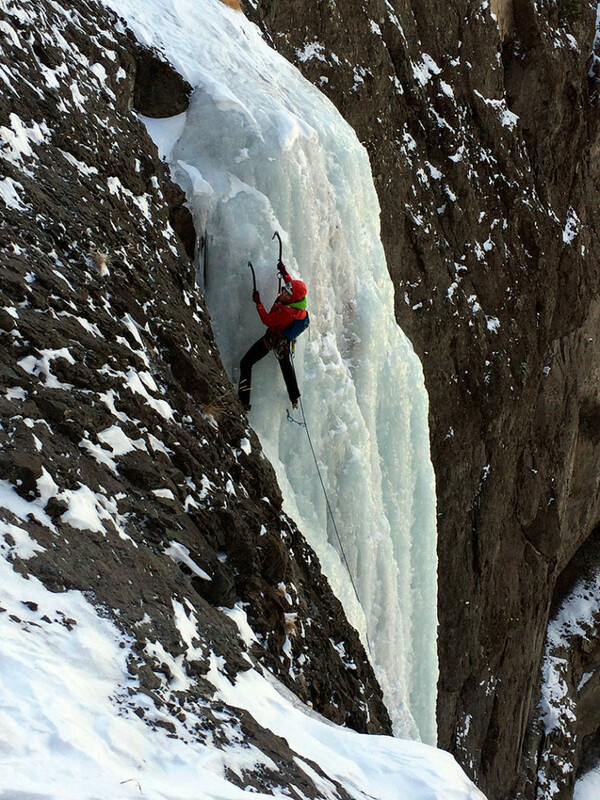 The Cody ice climbing program focuses on multi-pitch ice climbing in the backcountry. If you have attended one of our Ouray programs and yearn for more adventure, this is the next step in your learning progression. You will journey into the Wyoming wilderness, it feels remote because it is, but there won’t be any crowds in the areas you will go to. The Cody backcountry ice climbing program is physically demanding and it requires fitness and stamina to access the climbs. The approach to most of the backcountry ice climbs is snowy hikes with a potential stream crossing. This clinic is recommended for Level 2 (advanced beginner) to Level 4 advanced climbers. Multi-pitch rock and or ice climbing experience is preferred and you should be able to climb WI3 effortlessly. We will base our Cody ice climbing program out of the Double Diamond X Ranch (DDX). The ranch is a perfect blend of seclusion and accessibility. You’ll have a warm bed to sleep in each night and delicious meals prepared by your guides. The DDX Ranch is in the middle of the South Fork valley, with trailheads to the ultra classics within minutes of the ranch. With no wifi or cell service to distract us, we can truly focus on our climbing. Don’t miss your chance to be a part of this unique trip. If you own it, bring it. We have limited demo gear available, please let us know 1 month in advance if you need to borrow any equipment. Arrive in Cody Wyoming early enough to drive an hour from the airport to the DDX, (directions provided). Get settled into your room at the DDX. Allow about an hour of extra time if you plan to stop for groceries. 4:00 pm: Kick-off meeting/orientation at the DDX, Catered group dinner. 7:00 am – 5:00 pm: Climbing in the South Fork Valley. 7:00am – 5:00 pm: Climbing in the South Fork Valley. Please plan to travel home on Day 5. DDX check out is 11:00 a.m.
*Travel insurance is required for all International Trips and is strongly recommended for US programs as well. In the event, you have an unexpected life occurrence and need to cancel it will help you recover your payment. Chicks works with an agent who is familiar with our programs and travel insurance needs. Please contact Erin Rountree at 208-788-2870.